Back in 1954 we got our first Tv! My Father brought a used one for $15.00 and set it up for watching that night, my Sister was about 14 years old at the time, told me a funny story about that night, she was so excited about having a TV and watching that night that she went around Mom Bruno’s’ candy store and brought candy and other snacks for that special night. So later on when we all gathered in the living room, she layed down on the couch, my Uncle and Aunt who lived upstairs in the building, came down to watch TV and sat right down on my Sister because the lights were low to view the TV better! She doesn’t remember what was on might have beeen the Ed Sullivan show, but she’s not sure. I myself don’t recall the night but she has a great memory of our first TV! The Donna Reed Show is an American situation comedy starring Donna Reed as the middle-class housewife Donna Stone. Carl Betz co-stars as her pediatrician husband Dr. Alex Stone, and Shelley Fabares and Paul Petersen as their teenage children, Mary and Jeff. The show originally aired on ABC from September 24, 1958 to March 19, 1966. When Fabares left the show in 1963, Petersen’s younger sister, Patty Petersen, joined the cast as adopted daughter Trisha. Patty Petersen had first appeared in the episode, “A Way of Her Own”, on January 31, 1963. Actress Janet Landgard was a series regular from 1963-1965 as Karen Holmby. I Love Lucy is a landmark American television sitcom starring Lucille Ball, Desi Arnaz, Vivian Vance, and William Frawley. The black-and-white series originally ran from October 15, 1951, to May 6, 1957, on CBS. After the series ended in 1957, however, a modified version continued for three more seasons with 13 one-hour specials; it ran from 1957 to 1960. It was first known as The Lucille Ball-Desi Arnaz Show and later in reruns as The Lucy–Desi Comedy Hour. I Love Lucy was the most watched show in the United States in four of its six seasons, and was the first to end its run at the top of the Nielsen ratings (an accomplishment later matched only by The Andy Griffith Show in 1968 and Seinfeld in 1998). The show is still syndicated in dozens of languages across the world and remains popular with an American audience of 40 million each year. A colorized version of its Christmas episode attracted more than 8 million viewers when CBS aired it in prime time in 2013 – 62 years after the show premiered. A second colorized special, featuring the “L.A. At Last!” and “Lucy and Superman” episodes, aired on May 17, 2015, attracting 6.4 million viewers. I added the I Love Lucy website below in the 50’s links check it out! Say Howdy Doo to you. The character first came to life from the creative mind of Bob Smith who created Howdy Doody during his days as a radio announcer on WNBC (AM). 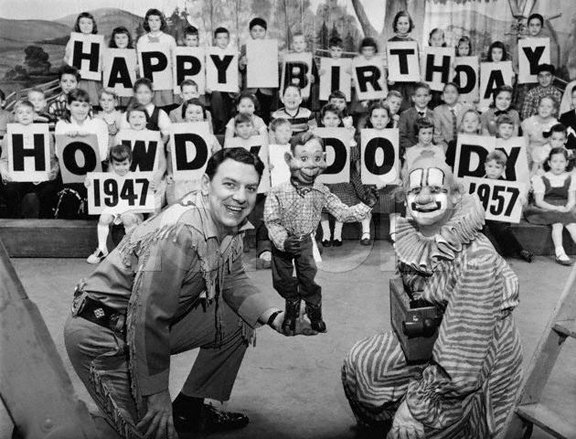 At that time, Howdy Doody was only a voice Smith performed on the radio. When Smith made an appearance on NBC’s television program Puppet Playhouse on December 27, 1947, the reception for the character was great enough to begin a demand for a visual character for television. Frank Paris, a puppeteer whose puppets appeared on the program, was asked to create a Howdy Doody puppet. The Mickey Mouse Club TV series premiered on October 3, 1955, my friend and I watched it every week! Our favorite Mouseketeer was Annette Funicello . It was a great show to watch for a lot of kids back then yeah what good days they were!